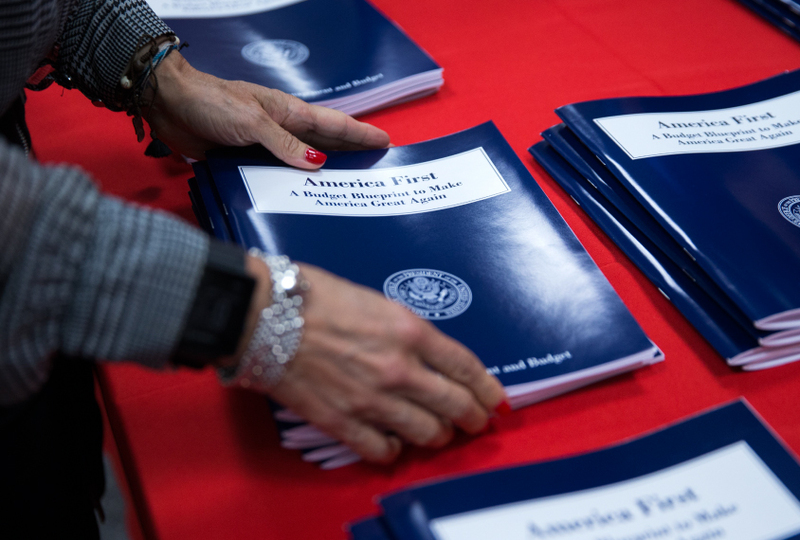 Copies of President Trump's America First budget at the U.S. Government Printing Office bookstore in Washington, D.C., 16 March 2017. An estimated $5.8 billion in cuts to the U.S. National Institutes of Health (NIH) in President Donald Trump’s proposed budget has California’s top universities and medical institutions sounding the alarm. Trump’s spending plan — running into opposition from Republicans and Democrats alike — would cut about 20 percent of the roughly $30 billion budget of the nation’s medical research agency that supports research on cancer, Alzheimer’s disease, Zika and other conditions. Research institutions nationwide have decried the cuts as potentially devastating to their work. Among those who stand to lose the most are the University of California, San Francisco (UCSF), which for the past three years has received more in NIH biomedical grants than any other public university in the United States. Grants to UCSF’s four schools that tailor to health professions reached nearly $634 million in fiscal year 2016, according to the University of California’s Office of the President. “It’s tremendously shocking,” says Keith Yamamoto, UCSF’s vice chancellor for science policy and strategy. “The hope was that biomedical research would fare well,” even in the face of the administration’s stated desire to control spending, says Yamamoto, a top researcher in cellular and molecular pharmacology. Total NIH funding for the University of California system in the 2016 fiscal year reached nearly $2 billion. At Johns Hopkins University in Baltimore, the institution receiving the most in NIH grants in 2016, an official described the potential budget cuts as “extraordinarily threatening.” Johns Hopkins received about $651 million in NIH grants. Officials at Harvard University, Fred Hutchinson Cancer Research Center in Seattle and the University of Alabama at Birmingham voiced similar concerns, noting that the cuts could set back basic scientific research that has led to lifesaving medical treatment. Based in Bethesda, Maryland, the NIH spends most of its annual budget — about 85 percent — on grants to thousands of researchers and medical institutions across the country. Traditionally, biomedical research has enjoyed strong bipartisan support, surviving ideologically driven cutbacks from one administration to the next. Grant increases to major NIH recipients had been averaging about 3 percent per year during the Obama administration. Congressional Democrats are already pushing back hard against Trump’s fiscal plan, as are some Republicans. Political observers caution that president’s budget proposals, though signaling administration priorities, rarely are approved by Congress without major changes. UCSF Chancellor Sam Hawgood says the cuts are “deeply disturbing,” calling the NIH and the research it supports “the envy of the world.” As a public institution, UCSF has honored “a pact with taxpayers by conducting research that has improved the health of all Americans,” Hawgood says. Federal money for research, in addition to leading to cures for disease, also stimulates job creation, with grant dollars being paid back many times over, Hawgood says. Last year, Stanford University ranked among the top 10 grant recipients, receiving 944 grants for a total of more than $427 million, according to NIH data. University officials noted in a statement that it is still “very early in the budget process,” but said it is clear that the proposed cuts would harm research in medicine and health, technology, the environment, the humanities, social sciences and many other fields.